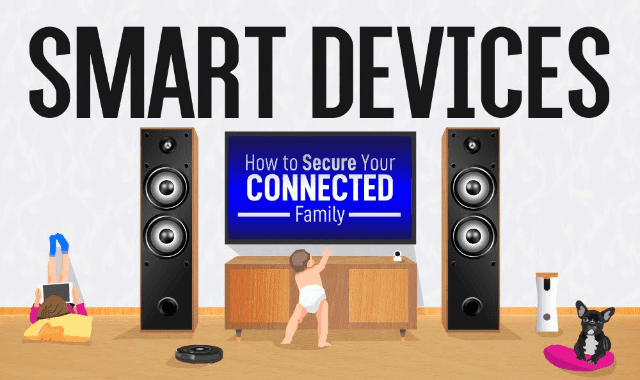 Smart Devices - How Secure is Your Connected Family? #Infographic ~ Visualistan '+g+"
By 2020, it is expected that over 20 billion smart home devices will be installed, that’s double the number expected to be installed this year. From smart coffee makers, Alexas, toys, and other such gizmos, the connected home is gradually becoming the modern home. But IoT devices come with their own risks, putting the responsibility on us to keep ourselves and our families safe. In 2018, hardly anyone can resist the appeal, convenience, and novelty of IoT devices. Smart lights, smart thermostats, smart locks, even smart washing machines and fridges surge our homes into the future. But the connectivity comes at a price, on top of the actual price tag. Default passwords, unnecessary or unused feature settings, and unpatched security updates can lead to a world of trouble and an easy opening for hackers and cyber criminals. A network is only as strong as the least secured device, and often it’s IoT devices that are to blame. Kick off Nation Cyber Security Awareness Month the right way; give your peace of mind by protecting your IoT devices, the data they manage, and the network as a whole. Take a look at this infographic for more on the state of IoT security, how to beef it up and ward off attacks, and get the most out of your smart home gadgets.